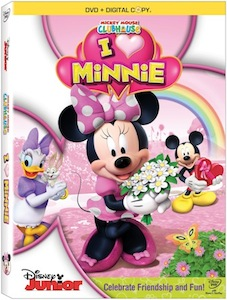 In Celebration of Mickey Mouse Clubhouse: I Heart Minnie release on Feb.7th you can click the graphic above for Valentine's Day Fun Pack! I don't know about you all but Mickey Mouse Clubhouse is a HUGE Hit in our house!!! My baby girl is in love with Mickey and his gang and just can't get enough of all of the shows. We make a point to watch them each morning. I was so excited when we had the opportunity to review this new DVD that will be launching on Feb 7th. When I showed my kids they got so excited and my baby girl started saying, " Hot Dot." Of course, for the Hot Dog song sung by the gang. I don't want to tell you what the show is all about but I do want to tell you that my kids loved it!!! If your kids are fans then you will definately want to run out to your local store and buy this for them. It would make the perfect gift for Valentine's Day! It is our Favorite Clubhouse movie to date!! Mickey Mouse Clubhouse: I Minnie has been packaged to include five, fun-filled episodes - each underlining the themes of friendship, teamwork, sharing and problem solving – and an all new bonus feature “You’re Invited to Minnie’s Birthday Party,” as well as two complimentary Best Friend necklaces to keep as mementos and/or to share with a very special someone this Valentine’s Day. · Minnie & Daisy’s Flower Shower (All-New, Never-Before-Seen) - The botanical highlight of the year is in trouble, unless Minnie and Daisy can get their flowers to bloom! Together, they board the glove balloon to help coax the clouds to sprinkle much needed rain. · Daisy’s Pet Project - The Pet Parade is almost here and Daisy needs to find the perfect animal for which she can love and care. But it’s not as easy as she thinks and soon she has three new friends: an elephant named Bubbles, a giraffe called Longfellow and a bunny called Captain Jumps-a-lot! · Minnie’s Rainbow - After a brightly colored rainbow appears over the clubhouse, Minnie searches for the pot of gold that’s supposed to be at its end. Along the way, she meets a leprechaun and discovers that not all treasure turns out to be as she expected! For more than 85 years, The Walt Disney Studios has been the foundation on which The Walt Disney Company (DIS: NYSE) was built. Today, the Studio brings quality movies, music and stage plays to consumers throughout the world. Feature films are released under four banners: Walt Disney Pictures,which incudes Walt Disney Animation Studios and Pixar Animation Studios, Disneynature, Touchstone Pictures and Marvel. Original music and motion picture soundtracks are produced under Walt Disney Records and Hollywood Records, while Disney Theatrical Group produces and licenses live events, including Broadway theatrical productions, Disney on Ice and Disney LIVE!. For more information, please visit http://www.disney.com/.